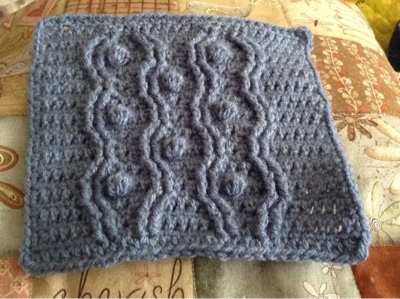 Since my last post I have been doing the Dancing in the Sea CAL, it was a 14 week CAL which I have obviously gone over, but for a while I have wanted to learn how to crochet and thought this was a good opertunity I could do the basic and found any classes I went to only gave me the basics which I already know. This CAL had a YouTube video for each square which was fantastic as I am a visual learner. I have now made it to the last 4 squares there where 48 in total. I am feeling pretty pleased with myself. This to me was the hardest square which happened to be week 3. Unfortunately the Cross stitch has been put away for the moment, I am still going to a monthly quilt group so my Alphabet quilt is still a work in progress nearly ready to start quilting it. 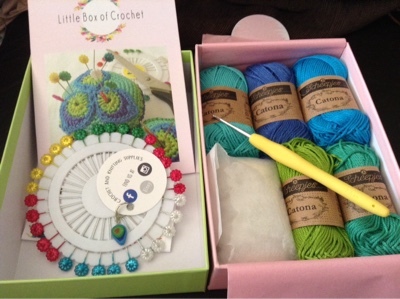 I am finding the crochet very relaxing and not as hard on the eyes I have also signed up for the Mystery Little Box of Crochet this is what came in July. 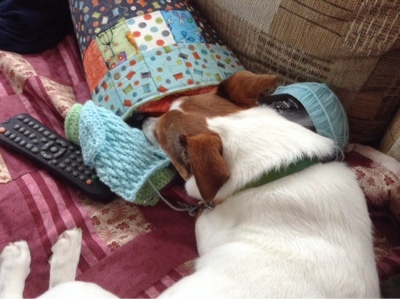 I feel my Jack Russell is going to love my blanket as at every opportunity she is in the middle of it. Thanks for sharing your beautiful crochet Jayne. I looked at the Dancing in the Sea CAL but I haven't finished my other two blankets yet (Spice of Life and Attic 24's Coast Ripple). 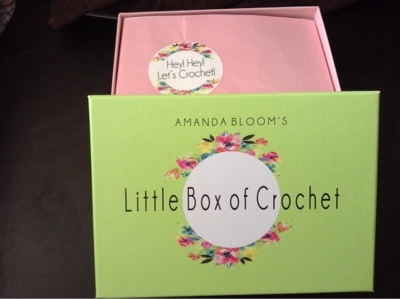 The Little Box of Crochet looks like fun too.